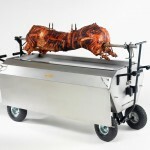 Buy a hog roaster for your catering company and get ready to delight your guests time and time again! There’s something truly scrumptious about a moist pulled pork bap with stuffing, crackling and apple sauce – a simple and perfect lunch, dinner or snack! 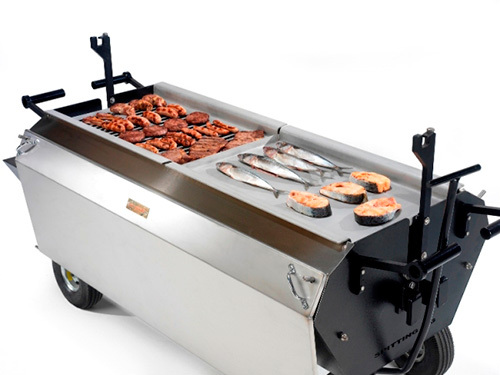 We have over 50 years’ experience in hog roasting, so when it comes to hog roasting machines we have a trusted reputation across the catering field. We are trusted by a variety of catering clients, from local chefs to large hotel chain. 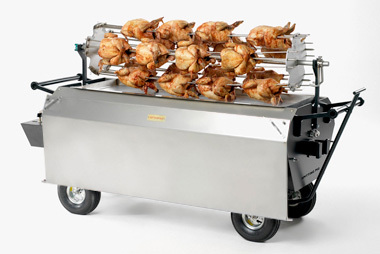 All our machines have been designed by roasting experts, to provide an affordable, professional and easy-to-use roasting solution. 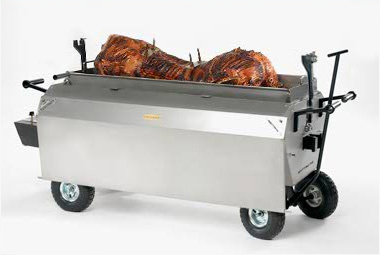 Along with roasted pork, our hog roasters can be used to slow-cook vegetables and other meats. 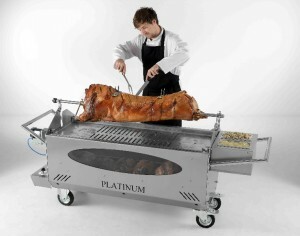 Our Platinum hog roaster is our best-seller. It has two unique cooking areas and dual gastronomes which means you can prepare a variety of additional food products alongside your meat dish. Ideal for cooking stuffing, gravy and soups. Heavy duty castor wheels and an effective steering system means our roasters are great for outdoor use. While the aesthetics of our machines are show stopping – slick, easy to clean stainless steel provides a professional appearance wherever you are. 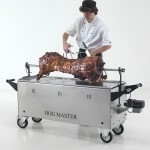 Want to expand your hog roaster further? 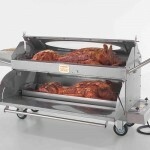 We have additional kits sets available to take your hog roasting machine to the next level. These include an extensive Chicken spit pole kit and our top of the range BBQ set for tasty barbeque dishes all year round. We also sell auxiliary accessories including: water proof covers and instructional DVDs. Due to high demand, we make sure we always have machines in stock. Next day delivery is available and we can ship worldwide. All our machines come with a 12 month warranty, annual servicing, 12 Gas safe certificate and full CE certification. Get in touch with us today to find out more and discuss our additional kits and accessories. 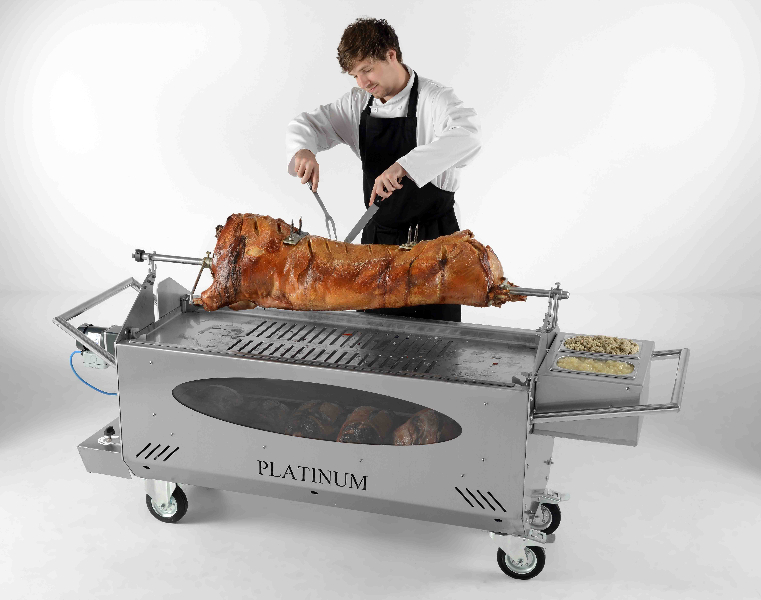 All our staff are hog roast caterers themselves so are well-equipped to assist with any of your hog roasting machine queries. Fancy test running our equipment at your next event? 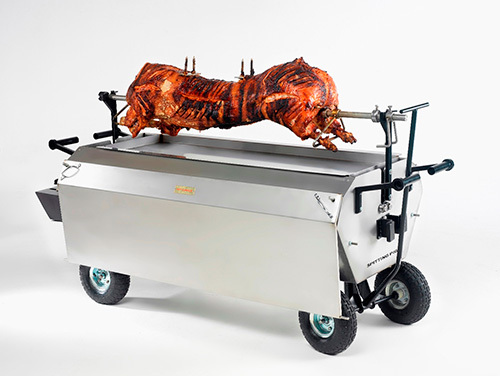 Talk to us about hiring before you buy a hog roaster.